Beech trees are a rarity in Wales, and those found in Cwm Clydach are at the most westerly edge of their range in the UK. 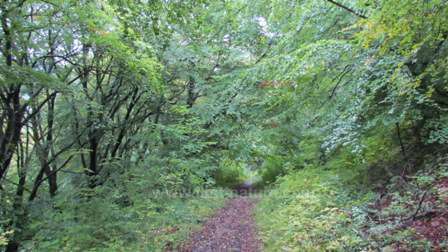 Although the woodland at Cwm Clydach is made up mainly of Beech trees, Sessile Oak, Ash and Yew can also be found in the area, and on the steeper slopes and limestone outcrops, there are also some rare Whitebeam trees. Cwm Clydach NNR lies in a steep limestone gorge through which the fast-flowing River Clydach passes, creating a number of attractive waterfalls as it makes its way through the gorge. Cwm Clydach NNR is managed by Natural Resources Wales (NRW). From Abergavenny take the A465 road in the direction of Merthyr Tydfil. About eight km (five miles) outside Abergavenny look out for a brown road sign for Clydach Gorge on the right hand side of the road, indicating a left hand turn. Follow this unmarked road up the hill, past a campsite and picnic ground both on the right hand side. 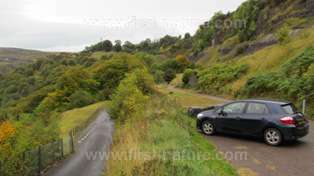 Turn right into Heol y Chwarel (Quarry Road), drive down the hill and then bear left up a steep hill towards the quarry. Do not take the right hand turn into Dan y Coed, which is a dead-end road. Pass the Cwm Clydach NNR sign on the left-hand side of the road and continue on until you reach two parking areas almost opposite each other; there you can park and then walk into the woods via any of the various footpaths that are nearby. Some paths are level and easy going but others, on the steep side of the gorge, can be slippery and dangerous in wet weather. The River Clydach is fast-flowing and has dangerous currents. There are information boards beside many of the paths within the woodland. 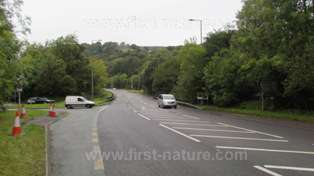 There are pubs, shops, cafés and public toilets in Abergavenny, which is about eight km (five miles) from the reserve. Beech woodlands can be dark places as a result of the dense tree canopy, and the resulting flora beneath the trees at Cwm Clydach varies in density and diversity depending on how much light penetrates to the woodland floor, how close it is to the River Clydach. There are also some grassy areas dotted throughout the reserve, and these tend to be relatively richer in wildflowers. Beech trees grow mainly in the shallow soils on the limestone rocks, but there are also areas where the soil is more acidic and in these places, where oak trees tend to be dominant, there is generally a greater diversity of wildflowers. Because of the humidity caused by the spray from the river, and the dense tree canopy that prevents the moisture from evaporating, the river banks are good places for lower plants such as lichens, mosses, liverworts and ferns, and several interesting species occur there including the lichen Stricta sylvatica and Hay-scented Buckler-fern (Dryopteris aemula). Other unusual plants in the reserve include the Bird's-nest Orchid (Neottia nidus-avis), Soft-leaved Sedge (Carex disperma), Oak Fern (Gymnocarpium dryopteris) and Yellow Bird's-nest (Monotropa hypopitys). 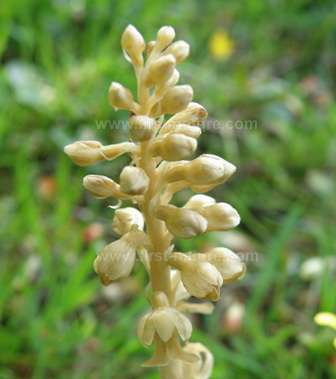 Both Yellow Bird's-nest and Bird's-nest Orchid are devoid of chlorophyll (green colouring) and they are unable to produce food from sunlight - a process known as photosynthesis. Yellow Bird's-nest is very rare; it gains nutrients from underground fungi which in turn obtain some of their nutrients via the tree roots to which they attach themselves. Bird's-nest Orchid is a saprophytic plant that feeds on dead and decaying matter on the woodland floor. Although it is pollinated by small flies, this orchid can also spread vegetatively via it root system below the ground. Its rather strange name derives from the form of its root system, which is said to resemble a rather untidy bird's nest. A walk in beautiful woodland is a pleasure at almost any time of the year, but a visit in the autumn will enable visitors to see the wonderful displays of fungi that cover the woodland floor. Really special species to look out for include Rose Spindles, the Rosy Pinkgill, various coral fungi, Giant Club, Olive Earthtongue and the very rare parasitic Powdercap Strangler, Squamanita paradoxa, which is pictured below. The Powdercap Strangler is a species of grassland fungus with an amazing lifestyle. 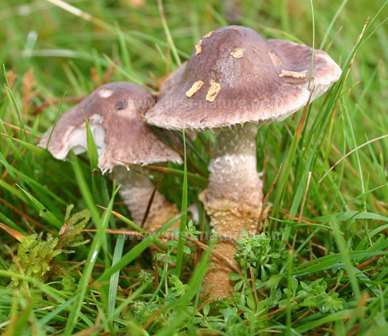 It quite literally invades another grassland fungus called the Earthy Powdercap, Cystoderma amianthinum, by growing its own stem and cap up through the stem of its hapless host. The result is the lower stem of an Earthy Powdercap with an upper stem and cap belonging to the Powdercap Stangler. If you look closely at the picture on the right you can see the colour change on the stem where the Powdercap Strangler grows up from the Earthy Powdercap's base. Cwm Clydach NNR is also a good place to see birds, and both the Green Woodpecker and the Great Spotted Woodpecker occur there. The whole area is good for birds of prey, and if you are lucky you may catch sight of Sparrowhawks, Buzzards, Kestrels and various species of owls.